The 20th feature film in the Marvel Cinematic Universe, Ant-Man & the Wasp marks the end of the ten year anniversary of the MCU which began with 2008’s Iron Man. 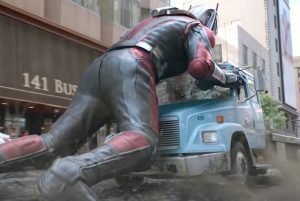 Ant-Man & the Wasp has pushed the MCU worldwide gross to over $17,300,000,000. That’s an astounding average of more than $865,000,000 per film. Chronologically, the story of Ant-Man & the Wasp is set prior to the events of April’s Avengers: Infinity War [see previous review] and connects most directly to Ant-Man (2015) and Captain America: Civil War (2016). Significant spoilers for Ant-Man, Captain America: Civil War, and Ant-Man & the Wasp are included in this review. The premise of Ant-Man & the Wasp revolves around Dr. Hank Pym (the original Ant-Man) and his daughter Hope van Dyne (the current Wasp) seeking to rescue Hank’s wife and Hope’s Mother, Janet (the original Wasp), along with the help of Scott Lange (the current Ant-Man). In 1987, Janet was lost to the sub-atomic quantum realm when she sacrificed herself to disarm a nuclear missile. 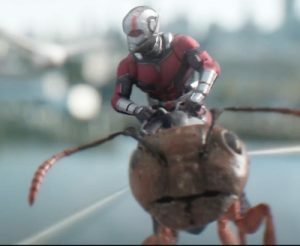 When Scott went sub-atomic to defeat the villain Yellow Jacket in Ant-Man (2015), he was able to return from the quantum realm. This led Hank to believe that Janet may still be alive and he began work on a quantum tunnel which would allow them to enter the quantum realm, find Janet, and bring her home. Hank and Hope have been working on this project alone and on the run. Scott has been under house arrest for the past two years due to his breaking the Sokovia Accords by aiding Captain America in the events of Civil War. Due to their connection to Scott, Hank and Hope are wanted by the FBI. Scott has been dutifully serving his sentence but is “kidnapped” by Hope when Hank believes that Scott has information that can help them save Janet. Throughout the film, Hank, Hope, and Scott must stay ahead of the mysterious “Ghost” who wants Hank’s tech for personal reasons, black market dealer Sonny Burch and his unseen “buyer” who wants Hank’s tech for financial profit, and the FBI agents who regularly check to make sure Scott is abiding by his house arrest and who are seeking Hank and Hope. All the while, they must race against the clock in order to save Janet. Though lacking in spiritual content, three particular themes are found in this film which present opportunity for discussion of spiritual matters. Ant-Man (2015) set the tone of family bonds for all the main characters. Ant-Man & the Wasp powerfully continues this theme. The family dynamics, while portraying realistic and difficult circumstances, are not presented in the all too common way of Hollywood. Marriage is handled respectfully. Parent and child relationships are handled respectfully. Genuine reconciliation is stressed. Scott is certainly a flawed character, but he is also a father who is making every effort to provide for his daughter, set her a good example, and keep her safe. Over the story arc of both Ant-Man films, the character of Hank goes through much growth as a father as well. His reconciliation with daughter Hope is a powerful illustration of a man who was certainly guilty of “exasperating” her (Ephesians 4:6) who then sought, and received, forgiveness from her. Scott is divorced from his first wife (Maggie), and yet even the divorce and resulting family dynamic is handled in a tactful way. Rather than presenting divorce as society often does – as a perfectly fine result of one or both partners seeking their own happiness – their divorce is presented as a painful result of Scott’s sins. The full details surrounding the divorce are never revealed, but you could certainly see hints at biblical reasons for Maggie to divorce Scott. At the same time, Maggie is still kind and compassionate to Scott and seeks to help him. As previously mentioned, the film opens with the revelation that Scott Lange has been under house arrest for nearly two years. The final three days of his two year sentence play out over the course of the film. Scott made the choice to side with Captain America in the events of Captain America: Civil War even though doing so made him a criminal. Scott reveals to Hope that his motivation for this was driven by his belief that Captain America was correct in his assessment that many lives were at risk (and they were). Scott broke the United Nations law (the Sokovia Accords) because of his sense of duty to save life. Scott’s actions had painful consequences. Confined to his own house, he was limited in his interactions with, and ability to care for, his daughter, Cassie. When Hank and Hope are apprehended by the FBI, Scott is again left with an agonizing choice. He can either abide by the law knowing that without his aid Janet will be lost forever or he can come to the aid of Hank and Hope and risk being caught and potentially losing his daughter for good. The 4thCommandment applies also to the governing authorities. The only time a Christian has the right to disobey the governing authorities is if their commands force us to do wrong. An Explanation of Dr. Martin Luther’s Small Catechism puts it this way: “What must we do if parents or superiors tell us to do what is wrong? If parents or superiors tell us to do what is wrong, we must obey the commandments of God rather than the commands of men, and patiently bear the suffering – even death – that may come to us on this account” (Evangelical Lutheran Synod, Mankato, MN: 2001, Question 50). Scott is not presented as a Christian, but his wrestling with obedience to authority and consequences for disobedience is certainly applicable to Christians. Scott wrestles with the question of at what point he can, or even should, disobey the authorities. Christians will also wrestle with this question. What will we do if it is in our power to save life but the government forbids it? One might find some parallels between Scott’s situation and current laws restricting pro-life activists. What will we do if laws are passed which restrict our freedom to proclaim that Word? The Gospel is life-saving and yet there is a growing push to label the content of God’s Word as “hate speech” and “bigotry.” Prayerfully, we will say with St. Peter, “We must obey God rather than men” (Acts 5:29). 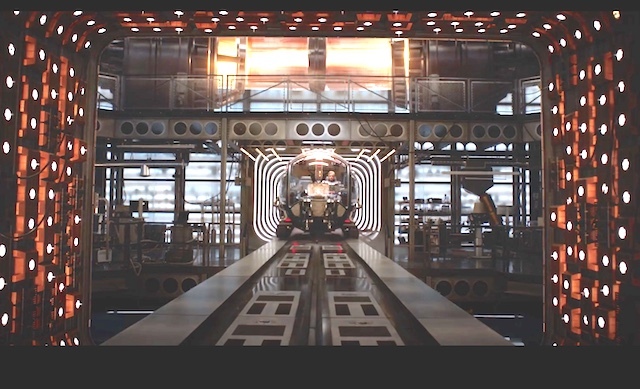 At the film’s climax, Hank and Janet return from the quantum realm. Ghost has attempted to extract quantum energy from Janet in order to heal herself. The extraction would have killed Janet, but Scott and Hope were able to stop Ghost. Ghost showed no regard for Janet’s life, even stating she has no problem with killing Janet to get what she wants. When Janet meets Ghost, who has been subdued by Scott and Hope, something unexpected happens. Janet uses the energy she obtained while in the quantum realm to heal Ghost. It is not uncommon for the villain to be shown mercy in our works of fiction, but it is rare for that to play out the way it does in this film. Typically, the hero must determine that there is some “good” remaining in the villain, or the villain proves her worth by doing something unexpectedly good, and then mercy is shown. That does not happen here. Ghost is the enemy. Ghost is the attempted murderer. Ghost has done nothing to deserve mercy. Yet, Ghost is shown mercy. One cannot help but think of St. Paul’s words in Romans 5. “For while we were still weak, at the right time Christ died for the ungodly.For one will scarcely die for a righteous person—though perhaps for a good person one would dare even to die—but God shows his love for us in that while we were still sinners, Christ died for us. Since, therefore, we have now been justified by his blood, much more shall we be saved by him from the wrath of God.10 For if while we were enemies we were reconciled to God by the death of his Son, much more, now that we are reconciled, shall we be saved by his life” (verses 6-10). There was no good, no worth, in us that led to Christ dying for us. The healing we receive by His blood was not earned. In fact, we were His enemies, but we have been shown mercy. Grace alone. This is our comfort, for we have no good to offer God. God offers us healing by the blood of Christ Jesus which has atoned for all of our sin. As all the MCU movies are, Ant-Man & the Wasp is rated PG-13. There is some innuendo (that may very well go over the head of younger viewers) and lots of fighting (but nothing gruesome or overly graphic). There is a fair amount of profanity. 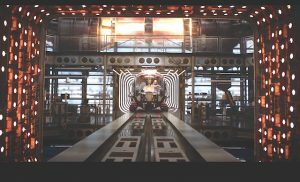 There is a little bit of weirdly vague spirituality in connection with the quantum realm. Ant-Man & the Wasp feels like the perfect sequel. It carries over the best elements of its predecessor while still telling a very different story. It has action, heart, and humor. It gives you characters to root for. The main villain is neither contrived nor predictable nor forgettable. By the time the end credits begin, the story has ended on a high note while also setting up future stories nicely. The careful observer will find significant clues to the future of the MCU. It also gives you much to think about in its themes of family, choices, and sacrifice. It should go without saying at this point, but if you’re following the events of the wider MCU and have seen Avengers: Infinity War, you absolutely want to sit through the credits to see the mid credits and end credits scenes. If you have not seen Infinity War, be sure to leave before the end credits scenes begin or you will have a major plot point of that film spoiled.